Just two days ago I had some of my clients doing sandbag cleans and I got a photo of Kit getting the 150# bag up and over his shoulder. I love this photo because it shows (to me) how much you have to use your hip to get the bag up and over your shoulder. Then Josh, unknowing of my Kit photo, sent me this great photo of Ken this morning. Kismet?? 1) Easy- KBSs (26/35), Hard- KBS (53/70). 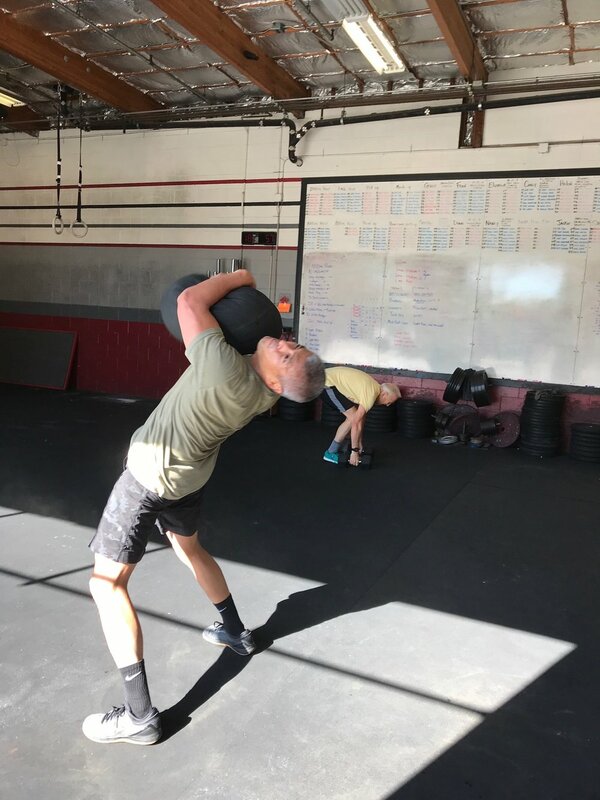 2) Easy- med ball cleans (14/20), Hard- sand bag over the shoulder (70/100). 3) Easy- tuck ups, Hard- GHD sit ups. 4) Easy- gassers, Hard- prowler push (50/100). 5) Easy- burpees, Hard- maneaters (20/30). The score will be the total number of matches reps.